Quick Take: The Office, "Christmas Wishes"
Review: The Office, "Christmas Wishes"
(S0809) That's right, once again it's that time of year. With the smell of booze and awkward situations in the air, it can only be a Christmas-themed episode of The Office. In years past the holiday episodes have always been little gems tucked neatly under the tree and it’s a pleasure that this season was no different. With a focus on Christmas wishes, Andy Claus has a lot of ground to cover. It wouldn't be an office Christmas without someone spending a majority of the episode in a Santa Suit. This year that responsibility fell on the Nard-dawg. Andy invited his new girlfriend Jessica to the office holiday bash and needless to say, Erin is a bit jealous. The jealousy does not stop there, because we find out that Robert has separated from his wife and is now a lonely puddle of Californication. This causes Andy to grow wary that Robert is moving in on Erin, which of course, shouldn't matter to him, but it does anyway. Eventually Erin and Andy have it out in front of the office crew after Erin says that her holiday wish was that Jessica would die. It's also nice to see the writers continuing to develop Jim and Dwight's characters to be more like brothers. Anymore it seems that their antics are done out of respect, rather than loathing. When Andy puts their holiday bonuses on the line to stop harassing each other, it only makes them harass each other more by trying to bait one another. After a couple pranks, some spray paint, and a porcupine everything is cleared up between them. For me every episode of The Office has at least one scene that makes my half hour investment worth it. Admittedly, these select scenes also tend to involve Dwight. It may, or may not have to do with that fact that I adore the Dwight character and feel Rain Wilson is a genius. Anyway, during this particular episode: Dwight charges into the conference room with a boom box, throws an iPod into the trash, and turns on Trans-Siberian Orchestra. We are greeted with an epic, yuletide, rock ballad as Dwight goes into mosh pit mode, and gifts are exchanged throughout the office. This was some pretty epic gift giving. As usual Meredith gets hammered at the party and her holiday wish was for Andy to be her designated driver. This, surprisingly enough, leads to very touching moment. Robert agreed to take Erin home since she had “about a thousand” drinks that night. I'm not sure if Andy was concerned, or jealous, probably a bit of both, but he ends up following Robert and Erin back to her place. He then gives a great sigh of relief when Erin leaves Robert for night and walks into her house. I was getting a bit worried that something was going to happen with Erin and Robert, because, well that would just be weird. In other news, Darryl looked stunning in his snazzy evening attire and Pam, for the first time that I can remember, is no where to be seen or heard in a holiday special. I know that she's on maternity leave, but I felt for sure they would have worked her in some how. All in all I felt pretty rewarded sitting down and sharing some holiday cheer with the Dunder Mifflin crew. 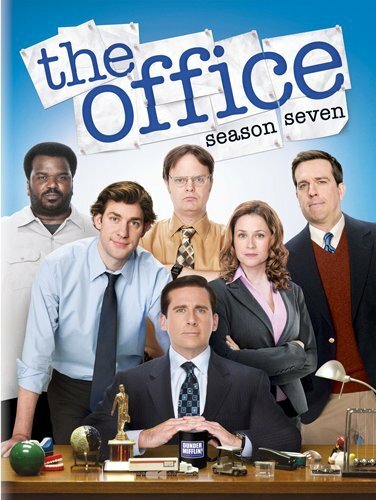 I've been *way* down on THe Office over the last few seasons, but I have to say that I've been pleasantly surprised by the past few episodes. Maybe the show is finding it's post-Michael Scott legs?